The British Economy as with other developed economies entered 2009 in recession and on the brink of Depression, after unlimited bailouts , hitting the Quantitative Easing panic button and running a huge 15% of GDP budget deficit, the UK economy has managed to claw its way back out of recession as the Q4 data will show when released during late January 2010. This in depth analysis is second in a series of three that seeks to generate accurate forecasts for UK inflation, GDP growth and interest rates for 2010 and beyond.The whole analysis and implications of will be published as an ebook that I will make available for FREE, ensure you are subscribed to my always free newsletter to get the completed scenario in your email box and check current ongoing analysis at http://www.walayatstreet.com. Britians Great depression is expected to end in the third quarter of 2009, the trend for which has been accurately mapped out in the in depth analysis and forecast of 17th February 2009 (UK Recession Watch- Britain's Great Depression? ), that both called for severe peak to trough economic contraction of -6.3% for 2009 at a time when the likes of the UK Treasury were forecasting contraction of less than half at -3%. The analysis also concluded in a strong debt fuelled economic recovery for 2010 to coincide with a summer 2010 General Election. As of the revised ONS GDP data (ABMI Chain linked at Market Prices) total peak to trough contraction is now 6.23% virtually exactly inline with the forecast for -6.3%. Annualised contraction for the third quarter is at -4.56% with trend on target for -4.75% for the fourth quarter. Therefore this analysis seeks to update the prospects for 2010 GDP growth forecast of 2.1%, as well as project the trend out for at least 2011 and possibly further out, which is in the face of over bearing mainstream press commentary that has jumped onto the double dip recession band wagon. John Majors Conservative government handed the New Labour government a lean mean economic growth machine back in 1997, which during the first 2 years of the new government the Labour party managed to restrain its traditionally tendencies of wasting money by sticking to strict limits on government spending. However increasingly following these first two years, the Labour party let rip with out of control public sector spending with a vengeance on the back of North Sea Oil revenues and the Casino Banking Sector profits that ensured that Britain skipped the Dot Com / Sept 11th recession of 2001-2002 that hit many other countries including the United States. Unfortunately both Tony Blair and Gordon Brown took this as a sign that they had acquired the midas touch, thus further escalating spending on the public sector that despite booming revenues from fictitious profits from the mark to market banking sector (for the purpose of paying huge bonuses) the Labour Government repeatedly broke its own Golden rules of balancing the countries finances over an economic cycle. If Labour had stuck to its own rules during the good times as they had repeatedly promised the electorate at each election then Britain would not now be peering over the financial abyss of an hyper-inflationary debt spiral. This out of control public sector spending is no better illustrated than the more than tripling of the NHS budget from £37 billion to more than £120 billion, which ignited a Gordon Gecko style greed is good ethos that gripped the NHS and wider public sector that sought to not only match the private sector in terms of pay but beat when pension entitlements are taken into account. 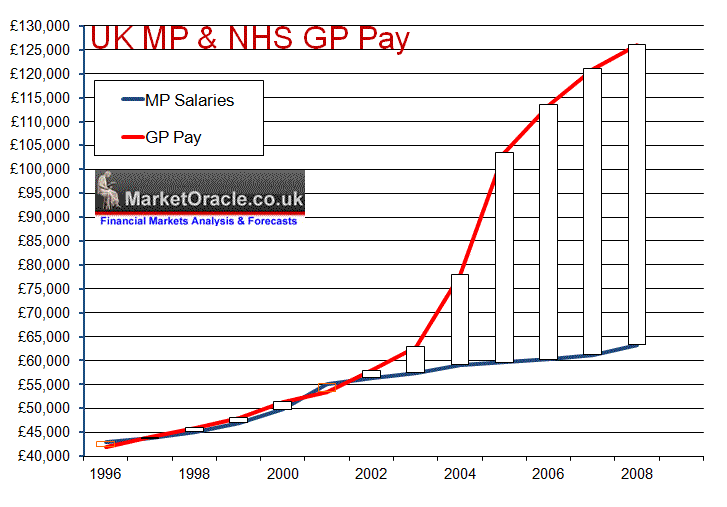 GP Pay illustrates the greed factor more than anything else that contributed towards the 2009 MP Expenses Scandal. When New Labour came to power in 1997 average MP pay was £43,722 against average NHS GP pay of £44,000, so both were inline with one another at that time. However as the below graph clearly illustrates in 2003 something started to go seriously wrong with GP Pay which took off into the stratosphere as GP's decided to award themselves pay hikes of more than 30% per annum at tax payers expense that has lifted average GP pay to over £126,000 per annum against £64,000 for MP's. This was as a consequence of the now infamous GP contracts where basically devious greedy GP's hoodwinked a gullible incompetent Labour government health ministers into signing up to contracts which were meant to deliver greater value for money for the tax payer but were instead designed to do the opposite and resulted in GP's pay doubling whilst at the same time cutting back on hours worked. This was not only a total fiasco for the nations health and finances but also ignited jealousy amongst MP's that directly led to the adoption of the policy of claiming expenses to the maximum so as to fill the ever widening gap between MP's and NHS GP's, as MP's could NOT get away with awarding themselves pay hikes of 30% per annum without losing their seats at the next general election in response to voter outcry, therefore across the board systematic abuse of expenses started to take place which basically means real average MP pay is currently approx £98,000 per annum. This example illustrates why the Labour party appears destined to leave office with the economy left in the worst state since any time since the Second World War. No British Government since WW2 has ran an annual budget deficit of 15% of GDP and it is this deficit as a consequence of the public sector spending black hole that the next Government will have to come to grips with which implies deep spending cuts of as much as 10% or £60 billion. The in depth analysis forecast conclusion for UK inflation for 2010 (http://www.marketoracle.co.uk/Article16085.html) included the following analysis points and conclusion that build towards the forecast for UK GDP growth for 2010 and beyond, therefore these analysis points are not being repeated in this article. Key conclusion of the inflation analysis projected to a strong bounce back in the economy which implies higher inflation, all of which was strongly indicated by the stock market that began a stealth stocks bull market back in March, that only now nearly 9 months and 60%+ later are most analysts looking in the rear view mirrors are starting to drop the bear market rally mantra and recognising the fact that the stock market is THE LEADING ECONOMIC INDICATOR . The article 2009 The Year of the Stocks Stealth Bull Market recaps my analysis that began with the birth of the Stocks Stealth Bull Market in March, all the way into a year end target of 10,500+ on the Dow. My analysis for the stock market for 2010 will follow in January. The next government's primary objective will be to to get an urgent grip with Britain's out of control budget deficit that risks an out of control inflationary debt spiral due to ever escalating interest payments exacerbated by a depreciating currency as a consequence of continuing money printing (QE) to monetize the deficit. The Labour Governments most recent updated projection for the annual Public Sector Net annual deficit remains unchanged against Alistair Darlings April 09 targets, as well as my original estimate of November 2008 (Bankrupt Britain Trending Towards Hyper-Inflation? ). The existing government deficit reduction targets as of the November 2009 budget is to reduce the deficit by £23 billion per year for the year 2010-11 onwards. However as I pointed out in the article Britain's Inflationary Debt Spiral as Bank of England Keeps Expanding Quantitative Easing, reducing the deficit by £23 billion per year does nothing to stop the deficit from expanding by a further £510 billion or 42% of GDP, i.e. there is NO DEBT REDUCTION, Instead DEBT Escalates by a further £510 Billion. Therefore the Labour governments deficit reduction targets are NOT sustainable, as the market will NOT allow £510 billion of new debt to be issued on top of the existing debt mountain of over £1 trillion. Which is leaving aside for the moment total liabilities that look set to expand to over £4.75 trillion. The only solution to the path Britain is on is for a balanced budget, in that regard the best way to achieve a balanced budget is to grow ones way out of debt i.e. increase revenues, failing that the option available is to inflate ones way out of debt which is what the Labour government has enacted through its policies of Quantitative Easing, Zero Interest rates and increased public spending. However what a government should not do is to listen to the deflationists and trigger another recession. So it is going to be a tough balancing act for the next government as it will need to cut spending, increase taxes AND grow the economy so as to bring the deficit under real control, not the nonsense of cutting the deficit of £23 billion per year for the next four years which as I have illustrated means at least an extra £510 billion of debt. The current financial years deficit is projected to be £185 billion or 15% of GDP, this needs to be cut to below 5% of GDP or £60 billion, within a short period of time but WITHOUT triggering a Double Dip Recession, which would just bring Britain back to square one i.e. were we were 6 months ago. Both Labour and the Conservatives have made loud noises of making severe cuts to public spending but when one looks at the actual figures pumped out they are non existant for the Conservatives and show INCREASED public spending for Labour. This is clearly electioneering therefore without any real contract figures before me I can only guesstimate that cuts of approx 4% will follow in the post election budget which is significantly less than the 10% that would be necessary, which is not going to happen when the mega spending departments of NHS, Education and Welfare have been ring fenced for growth, which means a 10% cut is impossible. Public sector spending cut by 4% would equate to about £24 billion. My existing forecast for the UK economy is on track for 2%+ growth for 2010, therefore this should like for like imply a 2% cut in the annual deficit or £24 billion by means of increased revenues due to economic growth. Tax rises have already been scheduled by Labour party to start kicking in during 2010, with the first on 1st of Jan 2010 when VAT goes back up from 15% to 17.5% with NI scheduled to follow in April. Add to this the projected post election tax hikes of an increase in the basic rate of income tax to 24p and higher upper band increased from 40p to 45p.Though a further VAT hike to 20% may be overkill and could trigger the feared double dip recession that would be a disaster, so I doubt if 20% VAT will follow, but it is a tough call as it could raise a further £12 billion per year. In conclusion total tax revenues could increase by a sizeable £30 billion a year and contribute to a significant dent in the deficit. Therefore putting all of the probable spending cuts, tax rises and increased revenues from economic growth all together, then by the start of financial year 2011 the budget deficit could be cut by £78 billion to approx £100 billion instead of the Labour governments target of £162 billion. A deficit of £100 billion would still equate to about 8% of GDP, so would still require more money printing to monetize government debt, but the cuts would not be so severe as to trigger a double dip recession and therefore allow the government to both grow and inflate its way out of debt during the subsequent years i.e. the country will experience below trend growth coupled with higher inflation that would target a rate above the Bank of England's 3% limit, which suggests that the next UK Government may set a NEW Inflation band of 2% to 4%, which is inline with the outlook being painted by the inflation forecast. On this basis the deficit could be cut to about 4% of GDP by the end of the third year of the next government, so hope for saving Britain from the debt spiral is not lost, but it does require urgent action as the longer the country accrues budget deficits of approaching £200 billion the greater will be the price paid in terms of debt interest payments that are already at £44 billion per year and could easily pass £80 billion if the Labour party's current 5 year deficit reduction plan is followed. I hope the next Government will have learned the primary lesson from last years Financial Crisis, which is that the longer you leave a crisis to fester the greater will be the eventual crash. With regards Britians Debt Spiral, that crash would be for UK Government Bonds and Sterling, which would trigger panic reactive measures. So it is infinitely better to grab the debt bull by the horn BEFORE the inevitable debt collapse occurs. The next government will have 5 years to prepare for the next general election of 2015. Therefore it has at its disposal the valuable asset of time to engineer an economic boom into 2015. This suggests two harsh years of economic activity i.e. below trend growth, followed by two years of above trend economic recovery into the 2015 election. The Bank of England's actions throughout 2008 and 2009 have shown that it's primary objective is to massage the UK Government Bond market. The evidence for this is in the fact that the vast majority of the £200 billion of Q,E, has been utilised for the purpose of monetizing government debt i.e. buying gilts to prevent Gilt auction failures and higher yields. The original story of Quantitative Easing or Money Printing in statements made by the Governor of the Bank of England during February 2009 was that QE would be utilised primarily for the purchase of corporate bonds to help companies that were unable to sell debt / bonds to the banks. This is NOT what has transpired as most of the QE to date of £200 billion has been utilised for the purchase of Gilts, where even what little corporate bonds that have been bought are expected to be sold in the coming months. This tells me that those analysts that look to the Bank of England for possible answers for the UK economic growth indicators are following a red herring, as that is NOT the BoE's primary administrative function, the number 1 priority is massaging the Gilt market, yes inflation and economy come 2nd and third but only in so far as they impact the Gilt market. So the Bank of England could be a problem during 2010 as it continues to adopt a blinkered attitude towards the economy much as it did during the Great Recession of 2008-2009, in that the Bank of England sat twiddling its thumbs whilst the economy burned and it was only after the Prime Minister took control of interest rates away from the Bank of England on 8th of October by announcing the first of a series of cuts in UK interest rates from the Prime Ministers Despatch box rather than by the Bank of England as I mentioned around the time. The MPC meeting is widely expected by the consensus to cut UK interest rates by 0.5% today, however as my recent articles (Credit Quake Persists Ahead of UK Interest Rate Cut of 1%?) have concluded that effectively Gordon Brown cracked the MPC round table in half when he stood up at the House of Commons despatch box on 8th October to announce the interest rate cut of 0.5%, which was followed by the Bank of England's announcement. This suggests that the Monetary Policy Committee is now no longer totally in the control of setting UK interest rates and therefore in many aspects control has been transferred back into the Governments hands. At the end of the day the Bank of England will first look after fellow bankers and then placate the government by giving lip service to the wider economy for were it the institution that many think it is then it would not have contributed in a big way towards pushing the UK economy over the edge of the cliff during 2008 by sitting on interest rates of 5% for a whole year AFTER the credit crisis broke and the UK housing market peaked. The Bank of England coupled with the FSA contributed to towards the creation of the financial crisis through means de-regulation of the banking sector that ensured that bank officers turned their banks into hollow husks for the purpose of maximising bonuses on the basis of fictitious profits, with the liabilities at the end of day being dumped onto the tax payers. Had the Bankers that run the Bank of England done what the people thought they were there to do then the banking crisis would not have happened! For we are not talking about a new institution on a learning curve that is just a few years old, but rather a 300 year institution that knows full well the ins and outs of the banking system that it created over the centuries that exists primarily to turn everyone, including the government into debt slaves. The mainstream press instead of holding the Bank of England to account is praising the bank for its actions in preventing an Economic Depression. The Bank of England whilst talking about halting QE several times throughout 2009 that the mainstream press lapped up in July, which at the time I mentioned was NOT possible, as the BoE will continue with QE to ensure Gilt Auctions do not fail. The BoE will also put increasing pressure on the government to cut the deficit asap so that the Gilt market is under less pressure, regardless of the impact of a too severe cut in the deficit i.e. triggering a double dip recession. I projected a Quantitative Easing total towards £250 billion by the end of 2009 with the current tally now standing at £200 billion of money printed as a debt consequence of the Labour Government's objective of both aiming to maximise the number of seats retained at the next General Election as well as to deliver a scorched earth economy to the next Conservative Government. Therefore the Labour Government also wins because it gets to hide this Quantitative Easing debt as theoretically purchases and sales cancel each other out in the fantasy land of central banking accounting and feeble government auditing. I.e. by magic approx £200 billion of new government debt has vanished into thin air, for if had not been hidden under the carpet then UK Gilt interest rates would be much higher due to the increase in supply of approx 33%. The real damage of this game of smoke and mirrors is that the markets are not stupid and when they eventually do react to the progressive trend of QE it will be Earthquake style and that is to dump UK assets, bonds, stocks, cash and therefore hit sterling hard in a matter of hours let alone days or weeks which would send interest rates sky rocketing i.e. to discount the £200 billion of new hidden Q.E. debt. In the final analysis money printing as I have repeatedly pointed out over the past year is a scam perpetuated upon existing currency holders, i.e. savers. The Bank of England's actions of the past 12 months amount to alleged theft of the value of savings from savers by means of zero interest rates and the printing of money that seeks to destroy the value of capital / savings both gradually through the process of inflation AND at the point of time of a currency crisis. What this means for the UK Economy is that a. serious efforts will be implemented by the next Government to cut the deficit, and b. whilst the deficit is above £80 billion per year then Quantitative Easing will remain and continue to expand which suggests several more years of QE rather than several more months as the BoE officially continues to always allude to, which given its actual primary objective is not going to happen. China is leading the way to the return of global growth with expectations for GDP growth for 2010 of as much as 10%, which further confirms expectations for the potential of a global growth story surprise to the upside for 2010. Whilst at the present time many analysts / commentators worry about China market bubbles, much as they worried about the "stocks bear market rally" that was always destined for an imminent demise during 2009 which instead was one of the greatest bull markets in history. I don't see why China is not going to keep growing strongly for 2010, 2011 and beyond especially as domestic consumption becomes an ever larger part of China's growth story with other emerging markets not far behind. Having originally called the China stock market as a Great Buy at SSEC 2,000, with the index now at 3,200 up 92% from its bear market low just continues to prove how wrong the China doom mongers have been found out to be as the continue harping on about how China has to at some point withdraw the huge economic stimulus of 2009, though without understanding that with growing reserves of $2 trillion they do not have to as I pointed out back in June 2009. China Mega-trend Stocks Stealth Bull Market Update, SSEC Up 47%. Many of the comments I made at the time of China boosting World trade and commerce is coming to pass and will increasingly do so during 2010. So regardless of volatility during 2010, China will continue to notch up a further gains during 2010 AND 2011, We could easily see the Chinese stock market end 2010 above SSEC 4,200 which 'should' help elevate all major stock markets higher, just as the Chinese economy helps elevate the major economies higher. China's thirst for resources and energy also sets the scene for the continuing commodities bull markets right across the board as part of the inflation mega-trend scenario, which ensures mineral producing countries such as Australia and Canada and oil exporting countries will see China lift their economies higher as prices are driven higher. Implications for Savers and Investors will follow in my ebook which I will share for free on completion early January 2010, ensure you are subscribed to my always free newsletter to get this in you email in box. My next in depth analysis and forecast that builds on this analysis will be for UK interest rates for 2010. This analysis further reinforces my expectation that the public and mainstream press will be surprised during the next few months as the UK economy bounces back strongly in the first quarter and continues for the whole of 2010. If only Gordon Brown had one more year how things could have turned out so differently than what seems like the inevitable defeat that Labour are heading for. For all of Gordon Browns many faults he has succeeded in delivering an Election Economic Bounce for the Labour party. Which means that I will now have revise my UK election forecast as of June 2009 during January that projected Conservatives on 343 seats, Labour 225 and Lib Dems on 40. Considering the OECD recently had to double its growth forecast for 2010, it's clear forecasts are unreliable. The CBI predicts that the UK will exit recession in the fourth quarter of 2009, helped by consumer spending ahead of the VAT rise in January. But the group says the economy is unlikely to have returned to pre-recession levels by the end of 2011. This growth should prove sustainable well into 2010, and the average prediction from leading UK's economist is for Gross Domestic Product (GDP) to rise at a rate of 1.4% next year. As you can see there is a wide range from a cluster around 1% to the Bank of England at the upper end of 2.1% which is the most nearest to my own forecast for 2010 of growth of 2.8%. One thing that stands out to me is that academic economists and so called think tanks apparently do not understand the critical concepts of trend and momentum which has to be at the core for those that successfully trade the financial markets, some food for thought to end on.